You live in a house with 10 other people. For years you squabble and bicker. You make and break allegiances, you take over control of different parts of the house and steal each other’s things. You Tommy are good at it – and eventually you also commandeered the garden, and the shed for your own purposes. You also steal the next-door neighbours garden, their green house and an allotment. One of your house mates Hans is stuck in an upstairs room – he has no access to the gardens and gets frustrated. He eventually breaks out from upstairs and makes a move on everyone else’s stuff. A huge house fight breaks out which everyone gets dragged into. Ivan who lives in the attic takes the brunt of it – but no one thanks him because everyone’s scared of spiders. Everyone has lost though – so while Ivan lost two legs and an arm, Tommy lost a finger, Hans lost a foot and a hand. Once everything calms down – everyone gets together at a house meeting and decides it has to stop. The bickering, the stealing stuff. Everyone agrees that they’ll instead of being selfish will work together. It works – and for 70 years nothing gets broken, nothing gets stolen. Of course, people still won’t go in the attic because of the spiders, and everyone still grumbles that Hans talks too loud, and François has monopolised the fridge, but it works. They all just have to agree to be a little less selfish and get along. They begin to plan big things together – they’re building a new garden shed and a bird bath, they have plans to put a gate in the fence but are not sure how high to make it – they still argue a little, but they don’t fight. Tommy one day though decides that he’s fed up with the fridge situation, with the communal living, with sharing everything. He has a pang for his glory days of the past when he controlled everything past the clothes lines and beyond. He calls a house meeting and tells all the house mates they can shove it. He reminds them that he lost a finger for them (Ivan scoffs at this) – Tommy says he’s going to his room and he doesn’t want anyone else to come in. There’s a few confused looks – Patrick reminds Tommy that they have an adjoining bathroom – so locking that door might be a problem. François reminds Tommy that locking the door of his room will also prevent Tommy getting out – but Tommy is fixed on it. Everyone tells Tommy that’s a sad choice but it’s up to him – they remind him that he did make a commitment to help finish the bird bath just last week, so ask that he honour his commitments. Tommy refuses and starts going through the fridge looking for anything of his he can take back to his room. As he slams his door Tommy bemoans how little ‘respect’ he’s had from everyone. Anyone familiar with the Hillary Clinton Uranium story, will hopefully recognise it as a frightening horror show – and a lesson in how Facebook / Twitter and misinformation can now muddy elections and perceptions and make facts irrelevant. Trump won the election almost exclusively because innuendo propagated through social media is a thousand times more effective than boring fact bound media news organizations. These are all blatantly nonsense, and in a normal healthy political climate would be ignored – but republican desperation to return America to the right wing has caused a serious sea change that has all but shattered the democratic system. So instead of Benghazi and the Email server getting ignored as it should of been it resulted in 8 republican initiated investigations. While all of them failed to find any wrong doing, rather than accept the results, republicans immediately blamed Clintons sneakiness for their inability to find anything incriminating (by murdering witnesses for example). Donald Trump and the cable Fox news network ran the presidential campaign almost exclusively on this crooked Hillary rhetoric – in the two weeks before the vote, the Republican party was playing TV adverts and Trump was stating categorically that he knew Clinton was just days away from being arrested by the FBI for her crimes. That is horrific behaviour and something you’d only expect to see in nightmare authoritarian dictatorships. However Trump won – and America went back to sleep being told that the media lies. The Uranium story is fascinating because its another horror show and one which is playing out right now. 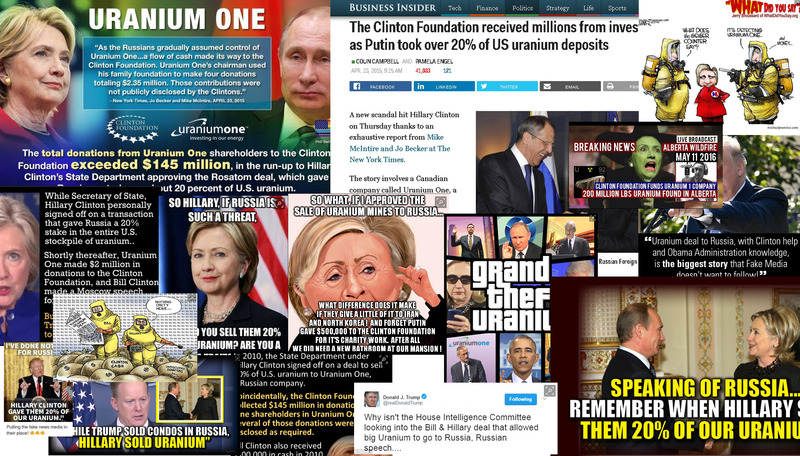 If you look on the internet you will find tens of thousands of memes along the lines of ‘So Hillary – if Russia is such a threat, why did you sell them 20% of our uranium. Liar, or a traitor or both‘ or ‘Russia takes control of 20% of US Uranium on Clintons watch, with donations to the Clinton foundation – but main stream media remains silent‘. “Uranium deal to Russia, with Clinton help and Obama Administration knowledge, is the biggest story that Fake Media doesn’t want to follow!“. “There is so much GUILT by Democrats/Clinton, and now the facts are pouring our. DO SOMETHING“. Trumps Attorney General yesterday has directed federal prosecutors to investigate whether a special counsel is needed to dig into the uranium deal. Its currently a feeding frenzy of misdirection. The problem is, very few people in America look past the headline – and the news media, especially on the right have very little reason to have something as irritating as facts kill a good story. So what are the actual facts. Well the facts are irritatingly boring. Firstly what is the implication. The implication is that uranium, that scary stuff which we know about from bombs was sold to Russians – by Clinton and she took bribes to do it. Is the uranium in question, weapons grade uranium? The answer is no – this is uranium for power stations. Is there something special about American uranium? No in fact Russia has three times more uranium than America – and America actually imports uranium from Russia and elsewhere. Was uranium sold to Russia? No a Russian energy company purchased a Canadian company that owns some mineral rights in America that includes land which contains uranium. Is the uranium leaving the US? No – even though the US government approved the sale of the company, uranium has not been mined and is not allowed to leave the country without approvals. So then the uranium which isn’t for weapons, which isn’t unique to America, which Russia has three times more of, which the US actually imports from Russia is still in the ground and cannot be sold outside of the US! While the Canadian company who owns the land is now 51% owned by a Russian energy company, so nothing actually illegal or questionable took place then!! So taking aside why would anyone need to bribe Clinton in order to do something which is entirely legal lets look at her involvement. Did Clinton have anything to do with approving the purchase? A committee for foreign investment with 9 members from various departments approves deals of this type. They can’t stop deals only approve them. The president is the only one who can object to the deal and stop it – So Obama. There is nothing to suggest that Hillary Clinton was involved in any way. Was there anything nefarious about the approval? No all 9 departments say they would still approve the deal if it came in front of them today. Was Clinton involved at all in the fact that this is nuclear material? No – The Nuclear Regulatory Commission has to approve all transfers and according to the rules: “No uranium produced at the facility may be exported”. Fox News – The largest cable news provider in America has been running this story daily since 2015, and there’s been 12 hours of coverage in just the last 3 days. Hannity Americas highest paid TV host (paid $30 million a year by Fox News) had an entire program last night entitled “Crooked Hillary Clintons web of Corruption” (his show regularly gets 3.5 million viewers). He is also a close friend of Trumps, and appears in Trumps promotional videos. This is blatant malicious propaganda. The FoxNews clips above show how despite all of the fact checking sites debunking this story – they insist on running with the innuendo rather than kill the story with facts. “There’s never been any evidence that Clinton acted inappropriately and the Clinton State Department had no power to approve or veto that transaction. It could do neither.” Indeed, the State Department was just one of nine agencies that signed off on the deal and Clinton herself wasn’t even on the committee. This is just one story – but similar frenzied republican attacks exist for the pro-gun lobby, the Mueller enquiry, Benghazi, Russian interference in the election, WikiLeaks relationship with Donal Trump Junior. There is a history in Western democratic societies of begrudgingly succeeding to your opponent when you lose the election, and respectfully standing to one side and argue the opposition points until your next chance at re-election. However in Trump and Fox News – we have a party which went into the election calling Clinton a murderer, a nasty woman, crooked, a traitor and not once did actual political differences become part of the story. Here we are a year later – and still Clinton remains a hot button topic amongst republicans, Trump and the propaganda wing of Fox News. At Trump rallies supporters still chant ‘Lock her up’, Republican Senators demand the FBI leadership resign because they’ve not found evidence yet to arrest Clinton. Trump on his flight back from Asia spoke more about his desire to see Clinton arrested than he did about the mass shootings at a school that took place that morning. A fact he tried to later rectify but mistakenly tweeted about the wrong mass shooting. “May God be with the people of Sutherland Springs, Texas. The current shooting is in California – A mistake Trump made because he cut and pasted from the mass shooting two weeks ago and forgot to change the location. This is Trump cutting and pasting about a previous mass shooting. None of this can last. Unfortunately the lies have been set so permanently into the minds of republicans that cognitive dissonance will ensure they blame, the lying media, fake news, deep state or the undrained Washington swamp before admitting to any actual facts. I think this is scary to even the republican traditional leadership – who are starting to realise that they’ve used propaganda to whip up a frenzy to get a narcissist television host into the White house. They’ve been trained to scream for blood, and its hard to see how they’re going to be de-programmed. They’ve even started turning on republicans that question them – with twitter attacks being launched by Republicans on Sessions, Bush and others if they don’t stay on message. I’ve always thought the number of traffic lights on the Great Western Hospital entrance on Marlborough Road Swindon were excessive. Today though I just thought I’d count them and post them online. The picture below shows the view coming from East to West (Top) from West to East (Lower left) and from the hospital (Lower right). In total then (and I have no doubt I’ve missed some) I counted 23 separate traffic lights. This is a junction which you can only approach from 3 directions! It’s essentially a T-junction with 23 traffic lights? Is the road planner trying to one-up the Magic roundabout which is only 3 miles from here, by designing something equally magical?